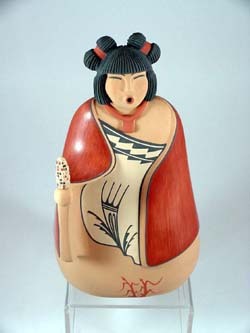 Leonard Tsosie was born in 1942 at Jemez and has been active in making pottery since 1991. 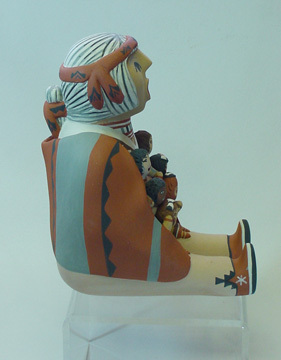 His work has earned him several awards at pottery competitions including the prestigious Santa Fe Indian Market. 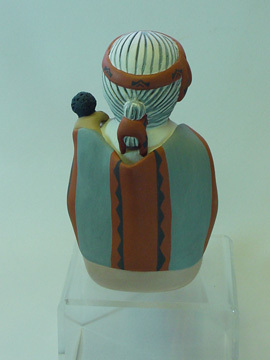 His creations include matte polychrome Storytellers, Drummers, Clowns, horses with children, jars and bowls. 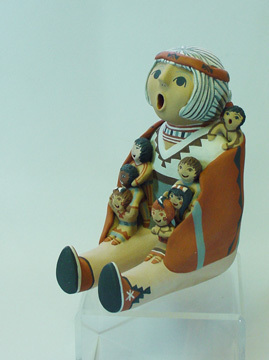 Traditionally, male storytellers wear a hat (or bandana) on their head, as this grandfather storyteller is portrayed, along with his white hair. 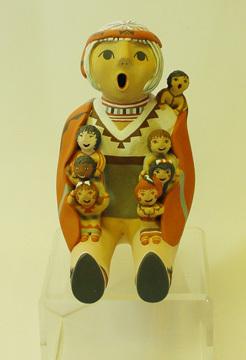 He sings to seven children, one of whom is peaking over his left shoulder. He wears a bandana on his head, is draped in a shawl and has painted choker around his neck. The clay that forms his hair is textured to give it a life-like appeal. His facial features are symmetrical and cleanly painted. The sculpture is large, measuring 8.5 inches tall x 5 inches wide x 7 inches deep, it is signed by Leonard and is in mint condition without defects of any kind.